Eyelid inflammation, known as blepharitis, is a common condition in which the eyelid gets inflamed and coated with oily particles and bacteria. Blepharitis is commonly associated with eyelid swelling, redness, itchiness, and stinging or burning in the eyes. There are four main types of blepharitis: anterior, posterior, mixed, and rosacea blepharitis. Anterior blepharitis is characterized by inflammation on the outside of the eyelid where the eyelashes are attached. The cause is usually bacterial or, in some cases, viral. Posterior blepharitis is a dysfunction of the eye’s oil glands located in the eyelids at the base of the eyelashes. Clogging of the glands can result in thickened eyelid margins and crusty eyelids. Mixed blepharitis is when anterior and posterior types occur at the same time, while rosacea blepharitis is associated with ocular rosacea, which causes swelling and redness of the eyelids. 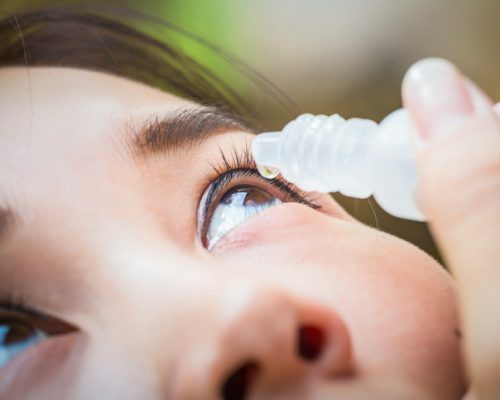 Maintain proper eye hygiene: Regularly cleanse your eyes with lukewarm water, use a cleaning solution prescribed by your doctor, always wash your hands before touching your eyes. Warm compresses: Use warm compresses to clean away debris and offer relief to the eyes. Place a warm washcloth over the eyes for a few minutes and keep on until it cools down. Repeat a few. Scrub your eyelids: Prepare a solution with water and baby shampoo. Dip a clean cotton ball into the solution and scrub your eyelids. Tea tree oil: Mix tea tree oil with coconut or olive oil. Dip a cotton ball into the solution and wipe it across your eyes. Castor oil: Wash your eyelids thoroughly, apply a warm compress on the eyes. Use a cotton swab to apply castor oil, and go to bed. The next day, wash it off. Coconut oil: Soak a cotton ball in coconut oil and wipe your eyelids. Rinse after 15 to 20 minutes. Aloe vera: Remove the fresh gel from a cut open aloe vera leaf and apply it to the eyelids. Leave on for 10 minutes, then rinse it off with warm water. Petroleum jelly: Use clean fingers to apply petroleum jelly to the eyelashes and eyebrows. This remedy is useful if blepharitis is caused by lice. Indian lilac: Boil neem leaves, and let it cool down. Use the solution as a hair wash. This will relieve dandruff, which can fall on the eyes and worsen blepharitis. Stand under a hot shower for five minutes with your eyes closed daily. Place moist tea bags on your eyes. Place freshly grated potato on your eyes. Apply manuka honey a few times a day on the eyelids. Avoid touching your eyes as much as possible. If you begin to notice eye inflammation, you should see your doctor to determine the cause. Ask your doctor about how long symptoms will last and what you can do to prevent blepharitis from recurring.